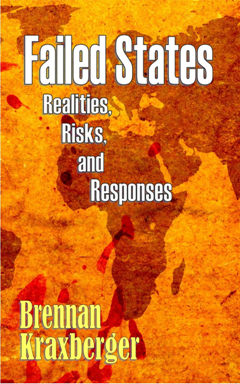 The book Failed States: Realities, Risks, and Responses by Brennan Kraxberger has just been published. The book is currently available through Amazon, and will be available via other distributors later this week. For more information – including an expanded free sample (with table of contents and index) – click here. The ebook version’s price is $4.99 (U.S. dollars). If you are a reviewer or a college instructor, please contact the author for a complimentary copy. The news business – at least in many advance democracies – is in a kind of crisis. Though the Great Recession added to the woes of many news organizations, financial pressures have been building for a much longer time period. Declining print circulations, the squeeze of free content online, and intense pressure from investors are just a few of the dimensions of the crisis. For many organizations, foreign news budgets have been a prime target for cuts. There is nothing inherently wrong with wire services – and both the AP and Reuters do fine work – but there are dangers in relying on a shrinking pool of reporters. Sadly, many news consumers are not very attuned to this downsizing of foreign news. We need more news organizations that model the British Broadcasting Corporation (BBC). No, I’m not necessarily calling for more public funding of journalism. The BBC is actually an outlier in the degree of separation it maintains from the British government; public broadcasters as propaganda purveyors are quite common in the world. What should be emulated is the excellent breadth of geographic coverage that the BBC maintains, even in an age of austerity. The London-based organization has long been known for having its own correspondents in most countries of the world. In comparison, CNN and National Public Radio (of the USA) don’t come close to the density of place-rooted reporters. Long live the BBC (model). As the U.S. election season heats up, most attention is being directed at the performance of the American economy. From the fourth quarter of 2007 – the official start of the Great Recession – the U.S. economy shed millions of jobs and the unemployment rate rose to almost 10 percent. Candidates and the public have rightly focused on job creation, or the lack thereof. What has largely been missing from the public debate about the health of the American economy is a concern for income growth. It is hardly shocking that the vast majority of U.S. workers have not seen much real growth in their wages since 2007. (Some who have kept their jobs – including many government workers – have experienced pay cuts.) What is more unsettling is the longer term trend of stagnant wages for a large share of the country’s workers. A recent series of posts on the blog Economix addresses this stagnation in the context of freer international trade. As the Economix post makes clear, the WTO and lowered tariffs are not the only reasons for income stagnation in the U.S. The United States is not sufficiently investing in basic infrastructure such as highways, airports, and urban public works. American schools are producing mediocre results, when compared to the country’s international competition. And, political gridlock in Washington calls into question the ongoing suitability of our constitutional framework. From a global perspective, though, the benefits of freer trade are clear. Emerging markets like China, Brazil, India, and others are benefiting from a more open international economic system. And, critically, tensions among the world’s major states are decidedly low by historical standards. The relative harmony among the world’s established and emerging state powers is in large part a result of global economic integration. The world’s most troublesome states – countries like North Korea, Zimbabwe, and Afghanistan – are some of the least integrated in the global economy. So, as we mark another Labor Day in the U.S., the answer to the challenge of wage stagnation is not protectionism. The benefits of freer trade – both economically and geopolitically – are immense. Nonetheless, strong pressures are clearly building in American society (and Europe), as manifest by movements like the Tea Party, Occupy Wall Street, and the anti-government militias. The U.S. is far from being a failed state, but more and more Americans are losing trust in the ability of government to facilitate economic outcomes that are deemed fair. The legitimacy of American political institutions is in decline. One need not be a radical leftist to point out that the main financial rewards of this era of globalization have largely gone to those at the top of the American class structure, and that long-term trend is leading to huge dissatisfaction across the society. Revolutions in information and communications technologies have undoubtedly been a key driver of globalization and a main factor in the recent creation of new wealth. Over the last generation, lowered transaction costs for enterprise and trade have helped propel worldwide economic growth, even with the Great Recession. Few question the benefits of cheaper phone calls, email, and ready access to information. In the security realm, though, developments in cyberspace are quite worrying, even though many remain blissfully ignorant of the brave new world we have entered. In traditional contexts, mobilization for and prosecution of “war” was more straightforward. Even if weapons of mass destruction and covert operations are thrown into the mix, the past was marked by relatively clear periods of “war” or “peace.” World War II was a global contest –rooted in Europe – between two networks of allies. The Cold War pitted two superpowers against each other and involved a huge arms buildup, proxy wars, and covert operations. Both of these “wars” had an end point, despite the differences between these conflict periods. What then should we make of twenty first century claims about “cyber-war”? Some would include “hacktivist” groups like Anonymous and LulzSec in a discussion of cyber-war. These groups – and individual hackers – have shown enormous capability to add disruptions and costs to private and public interactions. Arguably more worrisome, though, is the involvement of states in offensive cyber operations. Unlike traditional types of weapons, there is greater potential for governments to lose control of the weapons of cyber warfare. For example, computer viruses designed to target adversary states may “blowback” and affect people and organizations all around the world. As disturbing, the designations “peacetime” and “wartime” have become confused and mixed up in this new security world that is emerging. We seem to have entered an era of cyber-warfare without end. An innovation spearheaded by U.S. defense-industrial-scientific complex – the Internet – has gone from Cold War defense breakthrough to global social-economic connector to a major source of insecurity. This great assemblage of technologies, the “information superhighway,” offers us one of the most profound paradoxes of the new century.